Pamper yourself with a visit to the spa, which offers massages, body treatments, and facials. You can take advantage of recreational amenities such as a health club, an outdoor pool, and an indoor pool. This hotel also features complimentary wireless Internet access, concierge services, and babysitting/childcare (surcharge). Make yourself at home in one of the 7 guestrooms. Prepare your meals in the shared/communal kitchen. Complimentary wireless Internet access keeps you connected, and cable programming is available for your entertainment. Bathrooms feature showers, complimentary toiletries, and hair dryers. Medium size leading to a seating area. This modern hotel enjoys a peaceful position in an area of lush greenery, yet just a 8-minute by car from Braga's historic city centre. Hotel Joao Paulo II provides the ideal base from which to explore the city's main attractions, including Bom Jesus do Monte and Citânia de Briteiros. It also provides a relaxing setting for a well-deserved break, complete with a wellness centre, terrace, on-site chapel, restaurant and bar. In the evenings you can unwind in the comfort of your guestroom. All 91 rooms have recently been refurbished to offer a relaxing haven in which you can enjoy a peaceful night's sleep. A stay at ibis Braga places you in the heart of Braga, within a 5-minute walk of Santa Barbara Garden and Archbishop's Palace. 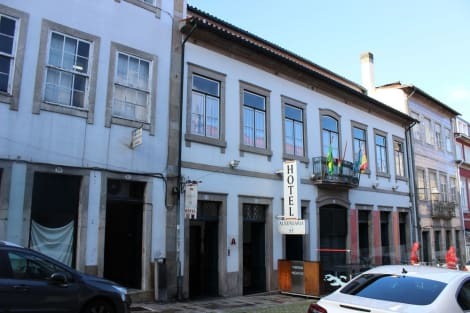 This hotel is 5.2 mi (8.3 km) from Bom Jesus do Monte and 0.8 mi (1.3 km) from Braga Cathedral (Se Braga). Its location allows you to enjoy the city and visit the most charismatic, leverage its extensive and varied tourism, culinary and craft. It has 11 rooms and 2 suites, equipped with air conditioning, radio, TV, telephone, Wi-Fi, minibar and safe. The hotel has Wi-fi, TV room, parking, laundry and business center. Enjoy a meal at Taberna do Migaitas, or stay in and take advantage of the hotel's room service (during limited hours). Quench your thirst with your favorite drink at the bar/lounge. Continental breakfasts are available daily for a fee. This wonderful hotel enjoys a delightful setting at the heart of Braga City. The hotel is located within easy access of the treasure trove of attractions that the area has to offer, and is bathed in the rich culture and history of the surroundings. Guests will find themselves within easy access of Se de Braga, as well as the Sameiro and Bom Jesus. Guests are greeted with warm hospitality and charm. The guest rooms are tastefully decorated, providing a warm setting in which to enjoy comfort and convenience. Business and leisure travellers alike will appreciate the wide range of facilities that this wonderful hotel has to offer. Guests are invited to enjoy a delightful breakfast in the mornings, and to simply relax in the evenings with a refreshing drink from the bar. lastminute.com has a fantastic range of hotels in Braga, with everything from cheap hotels to luxurious five star accommodation available. We like to live up to our last minute name so remember you can book any one of our excellent Braga hotels up until midnight and stay the same night.